Walking in Stilettos on Cobblestone Streets: Halloween has arrived! Halloween is my favorite holiday! The history behind Halloween fascinates me. I also love the leaves changing colors, the crisp air & sunny days, and wearing fall clothes (wearing cute warm-weather clothes outside with freezing is possible). 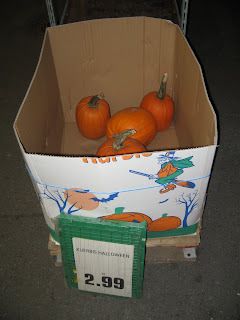 Pic above shows the pumpkin display at the neighborhood supermarket.